Edgartown man delivers meals — hearing stories, and helping people stay in their own homes, are all in a day’s work. 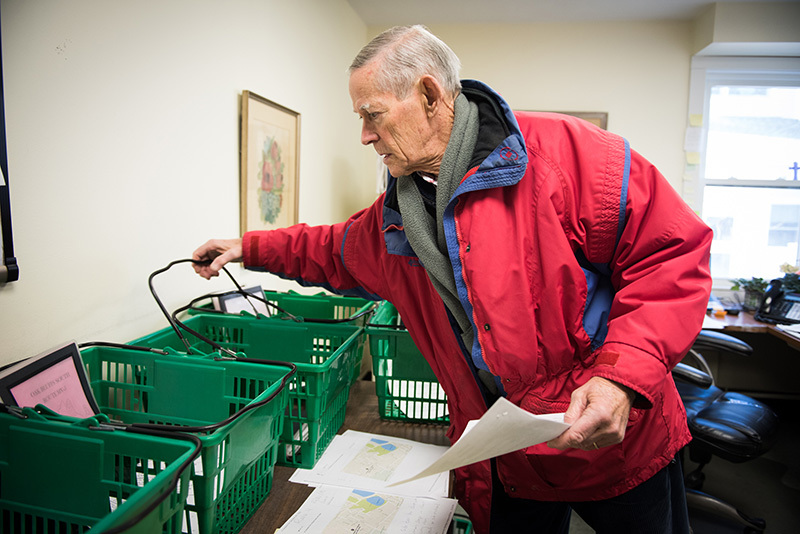 Once a week, rain or shine, for the past 10 years, Edgartown resident Bill Glazier has been delivering food to seniors as part of the Island’s Meals on Wheels program. For Glazier, volunteering — specifically Meals on Wheels — is in his blood. Two of his aunts volunteered in other parts of the country for the program that delivers prepared meals to seniors in their homes. Their enthusiasm rubbed off on Glazier. After a career in marketing, Glazier moved to the Island with his wife — another Meals on Wheels volunteer — to be closer to his daughter, son-in-law, and grandchildren. Every Tuesday morning, Glazier drives his Jeep to the Martha’s Vineyard Hospital and walks into the Meals on Wheels offices. He stops for a quick chat and exchange of pleasantries with staff and other volunteers before picking up his address list and cooler. Each cooler is filled with trays of meals prepared by the hospital’s kitchen. 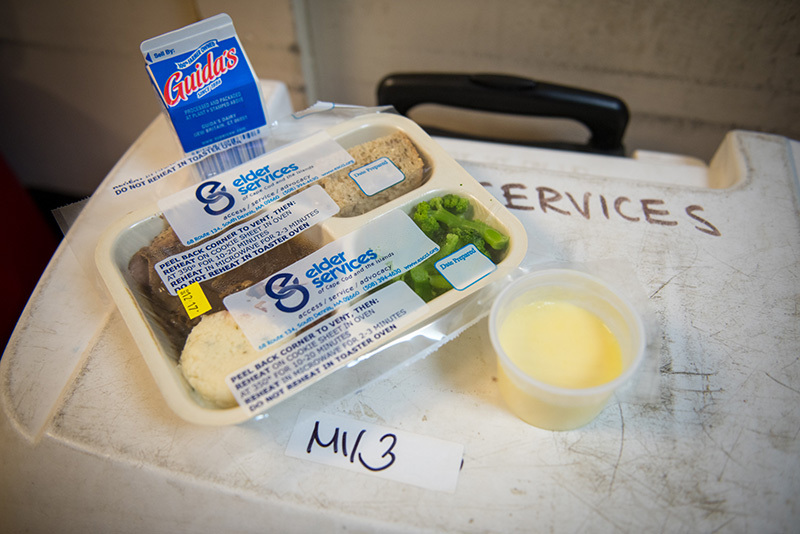 For many of the seniors, their main meal of the day is the lunch that Glazier delivers. “We get some good comments on how good the meals are,” Glazier said. 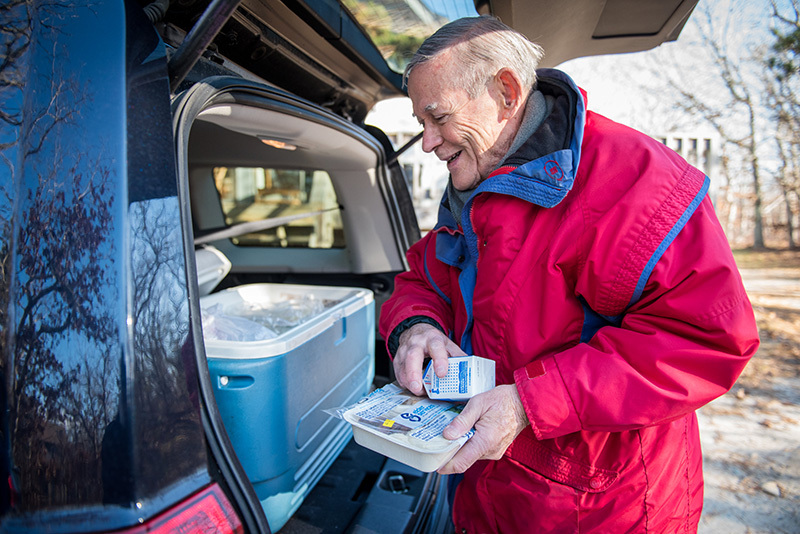 Meals on Wheels volunteers spend a few hours in the morning one day a week delivering meals to seniors. Glazier’s route takes him to 25 houses, up, down, and around Edgartown. 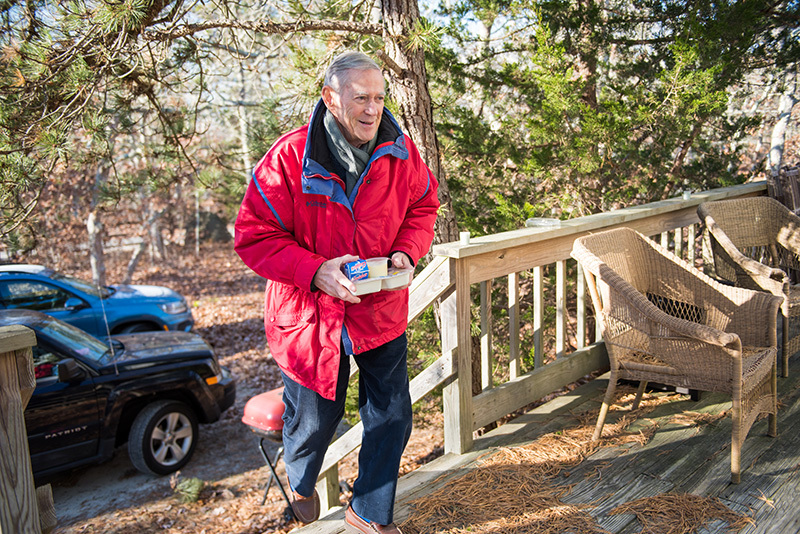 This can be challenging, because unlike routes in Oak Bluffs and Vineyard Haven where volunteers can park their car and deliver multiple meals at one stop, Glazier has to stop for each individual house as he drives across the wide swath of land that is Edgartown. He remembers getting lost on his first route, but after a few trips he got the journey down pat. Routes can get tricky for volunteers during inclement weather, but Mother Nature has to throw its worst at volunteers before they decide not to deliver the meals. According to Glazier, that rarely happens. One of Glazier’s favorite things about his volunteering is that his route has stayed the same for the past several years. Calling on the same houses week after week has let him form bonds with many of the seniors and listen to the bounty of stories they have to share. Those stories help him feel more like an Islander, and makes him a sort of walking Island encyclopedia. “I enjoy talking with the seniors. Just wonderful people. I learned all kinds of history, and heard wonderful anecdotes about life on the Island. That was from the first day, and ever since,” he said. Once a year Glazier takes the Edgartown selectmen around to meet and talk with the seniors. He’s noticed people on the Island are interconnected in one way or another. The first time he took the selectmen around, he was surprised they greeted several of the seniors like close friends. In addition to his service with Meals on Wheels, Glazier is a SHINE (Serving the Health Information Needs of Everyone) counselor. The program offers seniors advice and assistance on navigating Medicare; an AARP tax advisor who helps seniors fill out their income taxes; and the annual bird watch during Christmas.